White gauze bridal veil with flowers that has the effects of being spattered in blood. 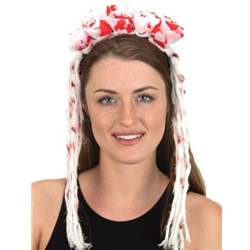 The bloody bride veil is one size fits most using the flexible headband. The bloody bride veil can be used for a murdered bride back to haunt the killer groom, as a ghost bride, or as a corpse bride costume. Pair this veil up with a white dress that has been spattered in stage blood or blood spray.